PLEASE NOTE: All the information in this blog piece is either freely available on the internet or extrapolated from that information. Some of it is direct results from a Google search, some of it from Companies House, some of the harder to find information is from direct quotes to trade publications where the breweries concerned were happy to brag to journalists about growth in one article whilst complaining about competition in another. I’ve now written a few pieces on Small Brewers Relief (SBR) and Progressive Beer Duty (PBR) as well as the proposals put forward by the Small Brewers Duty Reform Coalition (SBDRC) and the Society of Independent Brewers (SIBA), which have covered how those changes would affect the amount of Duty breweries would pay, as well as briefly covering where these proposals have come from, the data used and the companies behind it. However, in this piece I’m hoping to bring it all together, but it’s a rather tangled, complicated web that I hope to simplify. There will be charts. Firstly a quick summary of how we got here. The SBDRC formed in 2017 to campaign for greater Duty relief for brewers between 60khl and 200khl, and because any changes to SBR have to be cost neutral to the Treasury, they also propose that the relief for brewers between 1khl and 5khl should change too, with those breweries paying more. In March 2018 when SBDRC went public with their proposals, and membership as it stood Beavertown, Magic Rock, Siren, Wild Beer and Harbour distanced themselves from the organisation, publicly stating that whilst they were in favour of SBR being looked at, they did not agree with the SBDRC proposals. SIBA countered the proposals with their own, leaving intact the relief for breweries below 5khl, but increasing the top end to the same 200khl as SBDRC proposed. Both of these proposals aimed to remove what is currently seen as a “cliff”, a sudden increase in Duty applied once a brewery has grown beyond the 5khl size. This chart is rather large due to the vast range of production that the proposals cover. Most of the focus was concentrated at the lower end of production. I go through this more in this piece here, and whilst I may have promised graphs, this piece will contain more tables. The first thing to understand with these proposals is how they fit breweries. Exactly how big are the breweries who are looking for changes, how big are the breweries that aren’t? In the initial article last year I used ourselves, Cloudwater, Hogs Back, Butcombe, Hop Back and Robinsons as examples, because they covered a nice range of sizes and I could easily find their production levels. For this piece, however, I’m going to be looking at those breweries pushing for reform, the members of the SBDRC that I’ve been able to find. Yes, upon contact with SBDRC they have flat out refused to list their members. Yes, a flat out refusal to list who they actually are. The only other organisation I can think of that refuses to be public about its membership have a tendency for white gowns, hoods and a history of lynching. If any of these members of SBDRC (that are still brewing) are no longer a member than I will happily acknowledge that and update this article. Adnams, Black Sheep, Butcombe, Cotleigh, Daleside, Batham, Exmoor, Robinsons, Batemans, Hall & Woodhouse, Harvey & Sons, Hepworth, Hogs Back, Hook Norton, Hop Back, Holts, Lees, Lancaster, Moorhouse’s, Nethergate, Otter, Ridgeway, SA Brain, Shepher Neame, St Austell, Theakston, Taylors, Tring, Trumans, Wadworth and Wye Valley. I’ve left out the Marston’s brands and those that are either no longer brewing themselves, or have been bought out. So let’s start by having a look at these breweries pushing for a reform in SBR, their size, what relief if any they’re currently getting, and what relief they would get. At least, for those breweries I can get the information for. From this we can see that there’s a fair range of sizes of breweries calling for SBR to be reformed, with the smallest at 12,000 hl and the largest at 345,000 hl. The first thing that stands out in this chart is that Shepherd Neame, who at their much larger size wouldn’t stand to be directly affected either way, although the microbreweries in their area, the local competition, would certainly be affected. This table does however show that all the medium to large breweries stand to gain from the proposed changes they are campaigning for. But exactly how much are they set to gain? For this, we have to apply these extra percentages of relief to their production levels, making the assumption on the average beer being 4.2%, which is the average for the medium to large breweries. 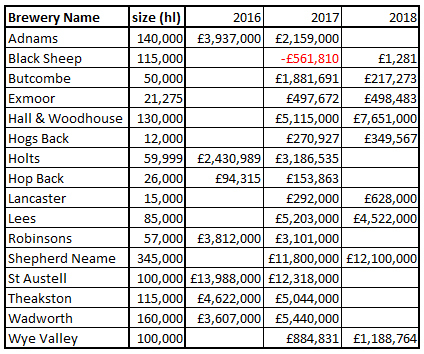 We’re starting to see more information here, that the largest breweries (other than Shepherd Neame) stand to gain between £100k and £200k a year. And the smallest will gain between £9k and £73k, there’s quite a difference between those two figures. The first would be if the SBDRC proposals were accepted, the second if the SIBA ones were. But how does this all look for the smaller breweries, after all any proposed changes would have to be cost neutral to the Treasury? At a first glance, this table looks bad for small breweries if the SBDRC proposals are accepted, but good if the SIBA ones are. A brewery growing just beyond the current 5,000hl cut off point could stand to save an additional £20k a year on Duty. Sounds great. Means that it makes it possible for them to grow. However, it also means that any competition currently around that size will suddenly start saving that money too. Also with the SIBA proposals a brewery at 12,000hl would suddenly get an extra £70k a year to either pay back investment, or to use to offset the cost of their casks or kegs, and start selling their beer out cheaper, undercutting the competition moving into that production range and having to use their savings to pay for growth. Both proposals benefit larger breweries over smaller ones, but it seems that the SIBA proposals will pit the small and the growing ones against each other in the already crowded local market places, allowing the 6,000hl to 12,000hl breweries that aren’t looking to grow to suddenly start reducing their prices to even less than they currently do, further undercutting the smaller breweries. But, hang on, isn’t it the smaller breweries that are undercutting the bigger ones? According to multiple interviews with the medium to large breweries in the trade press it certainly is. But using the figures recently published by SIBA (the newer set of data than the SBDRC used for their report), we can put together this table which breaks down the costs to produce a cask of beer depending on brewery size. This is production cost, not profit. The first thing to look at in this table is the “per Firkin” column, this is the full production costs for a cask of a 4.2% bitter. As the brewery gets larger the production cost drops, except for a blip around the 10,000hl mark where there is an additional increase in costs before the additional bulk savings come in. The second thing to look at is the last two columns, the effect of SBR on the cost of a cask of beer. Even with Small Brewers Relief, and the Progressive Beer Duty, the smallest breweries are the ones who have the greatest costs involved to produce a cask of beer. What we’ve seen so far from these tables is that the larger the brewery you are, the cheaper it is to produce beer, the more profit you can make per cask, and that you’re selling a lot more of those more profitable casks. 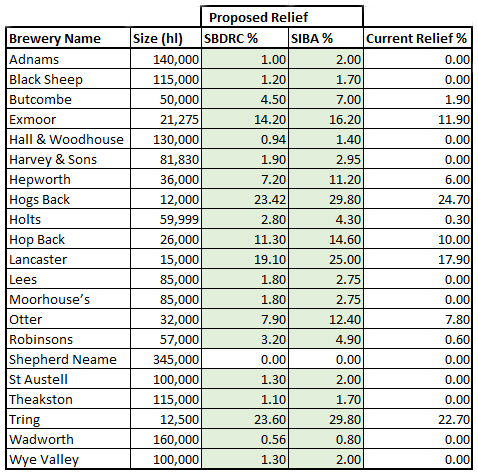 And that if either SBDRC or SIBA get their proposals accepted, that gap will widen between the breweries under 30,000hl and those above as the proposed changes to SBR increase the costs per cask. Is it so bad though, that breweries can grow and make more money? Absolutely not. But it’s what they do with that additional money that is important for the drinker. If a brewery looking to grow beyond the current 1,000hl Duty relief rate were to grow to 5,000hl, meaning that their beer was now £12 per cask cheaper to produce, that £12 could then be used to invest in the brewery: in better equipment, in staff training, in marketing, in having a day off occasionally. Or, that £12 a cask could be used to reduce the cost of their beers below the market norm, or to offset the “Buy 5, get 1 Free” promotions such as those that larger breweries run. That’s as SBR stands now; with further annual savings such as the SIBA proposed changes between 5,000hl and 10,000hl that “free” beer could be used to offset the costs of installing tied lines in free-houses. If the SBDRC proposals are accepted, a 5,000hl brewery stands to lose over £33k a year. That would mean job loses, if not breweries closing down. £33k may not seem a lot to the larger breweries, but it’s a business breaker to the smaller ones. One of the things about running a company in the UK is that you legally have to file your accounts with Companies House, and these accounts are public. So let’s now have a look at the profits from the known members of the SBDRC. The smallest brewery who’ll admit to being a member of SBDRC is Hogs Back (12,000hl) who made a profit in 2017 of £270,927. In 2018 they made £349,567, up £78,640 on the previous year. Their increase in profit alone between those two years is more than two 5,000hl breweries stand to lose if the SBDRC proposals are accepted. These figures in this table are very much a “light-touch” as they don’t take into consideration re-investment into the brewery or the tied estates. For example both Butcombe and Robinsons have invested heavily in acquiring or renovating tied pubs, and J W Less have done that too along with the investment needed for their new (and very nice!) 10bbl small batch kit. The accounts filed with Companies House for a lot of the larger breweries include a Chairman’s Report and these are very telling, “cost increases” and “significant investment” and other ways of saying the same thing are seen quite often in these reports. Over the last two years since the SBDRC formed to call for tax relief for the medium to larger breweries, those same breweries have been buying new brewery premises, new equipment and new pubs. They may have been getting cost increases, but so have breweries of all sizes. What we can see though, is that most of these breweries are still growing overall. The so-called “Squeezed Middle” seems to be doing okay overall when you look at their bank balances. So why the call for a change to SBR if the breweries calling for it are all growing? The only reason I can see for a call to change SBR in any way at all is to make even bigger profits. SBR was introduced to help new breweries set up by providing a level playing field against the economies of scale, and bring about a greater variety of choice for the drinker. But we’ve already seen that even with SBR, it costs more for the smaller breweries to produce a cask of beer than it does for the larger ones. It’s not a level playing field, but not in the way put forward by the SBDRC. The Squeezed Middle claim that smaller breweries are able to undercut them, but the facts and figures show it to be otherwise. And yet we can see from their own accounts filed at Companies House (and remember these are legal documents) that every single one of them is experiencing growth. Unfair how? Their proposals will hit small brewers by up to £33k a year whilst their smaller members will gain up to £70k a year. That hit to small brewers will almost certainly cause some, if not many to close down reducing choice on the bar, especially as these medium to large breweries are investing heavily in their estates and removing the free of tie lines available, which isn’t exactly fair to the drinker. And as for fair to the tax payer, most small breweries have a small accountant to make sure they pay their taxes, most large ones seem to use larger accountancy firms who know how to keep tax out of the tax mans hands. But, again, their own accounts show that it’s not strangling growth. And the number of breweries, and all their different beers, and the vibrancy of the industry as it is now compared to before SBR was brought in shows that it is far from damaging the industry. At present there is a disincentive to merge with or acquire other breweries because SBR is cut or lost immediately. We propose that in order to encourage orderly consolidation as the sector changes, SBR should be phased down over three years. This is definitely business-speak, but can be understood easier with examples, so let’s look at the hypothetical situation where two of the members of SBDRC decided to merge, or if one of them decided to buy out the other. Lancaster as a brewery over 5,000hl would be set to gain almost £15k a year in SBDRCs proposed Duty relief, and Hogs Back would gain just over £7. Whereas if Hogs Back bought them out the new company could gain almost £20k a year. If they were to buy out a smaller brewery, that figure would rise quite a lot. As it stands, if the two companies separately pay £2,245,320 in Duty. If they merged they would pay the same. Under SIBAs proposals they would separately pay a total of £1,636,089.84, whereas merged they would pay £1,926,035.60. A difference of £289,945.76 more. Under SBDRCs proposals they would separately pay a total of £1,773,353.74, whereas merged they would pay £2,009,785.93. A difference of £236,432.19. So under SIBAs proposals they would pay more Duty if they merged, but under SBDRCs proposals the cost of buying out another brewery has less of a financial hit on the Duty, and therefore the bigger brewery’s bottom line. This does not encourage an independent, vibrant industry providing choice for the consumer. It encourages companies to merge, acquire and buy out, reducing the range of beers available on the bars in the free houses. And this alongside the current trend of the larger breweries to be investing heavily in renovating and enlarging their tied estates leads to a worrying, and very real probability of a decline in the number of beers available to the drinker. The other part though to note in the SBDR proposal is “phased down over three years”, this is especially important when looking at buy outs that would take brewers out of SBR, over the newly proposed 200,000hl limit. If a brewery at 150,000hl bought out a brewery at 60,000hl the resulting brewery of 210,000hl would immediately no longer be valid for the increased SBR. However, with a three-year phase they would benefit from a year at 170,000hl (0.42%), and a year at 190,000hl (0.14%) Duty relief, a joint saving of almost £79,000. At the smaller end of the scale, if a brewery at 20,000hl were to buy out a brewery at 10,000hl they would have a year at 22,500hl (13.78%), a year at 25,000hl (11.95%) and a year at 27,500hl (10.12%) Duty relief before settling in at 8.3% Duty relief, a joint saving over those three years of £86,927.53 in Duty relief. So not only do we find that the larger breweries are able to produce beer cheaper, but that with this additional phased in relief buy outs and mergers become even more financially attractive whilst reducing consumer choice. The intent is even in their proposal: “We propose that in order to encourage orderly consolidation as the sector changes”, they are proposing a method to encourage buyouts and closures. – To encourage exports, any beer exported should be removed from the calculation of production volume that determines the level of small brewer relief. This is basically saying that any beer not sold in the UK shouldn’t count towards the volume of production used to decide how much relief a brewery gets. So taking our example breweries, as it stands Hogs Back (who employ an export manager) get their relief calculated at 12,000hl which is 22.7%. In this calculation it does not matter where that beer is sold for how much Duty relief they are eligible for. If however the export proposals go through, then it would. If Hogs Back increased production to 30,000hl, with 18,000hl exported to Slovenia or China as they hope, then they would still be rated at the 12,000hl level for Duty relief on beer sold in the UK. This sounds sensible at first glance, but that’s because we’re taking it as a stand-alone figure. What we’re not taking into account is that the brewery will now have the purchasing power of a 30,000hl brewery, not a 12,000hl brewery. At 12,000hl it would cost them £36.03 to produce a cask of beer, whereas at 30,000hl it would cost them £29.37 to produce that same cask. Almost £7 a cask cheaper than previously. That money could be used to reinvest in the company, to pay staff a living wage, to engage with and help their local community, or it could be used to undercut their local competition or just go straight to lining the pockets of their shareholders. The difference in price gets larger as the brewery’s local to export sales increases, it would even be possible for a 300,000hl brewery to export all but 5,000hl, have massive purchasing powers and sell that 5,000hl locally in deals with pubs to guarantee their beer, and that of their partners is also available, locking out any small competition. So as well as wanting a relief on the amount of Duty that these medium to large brewers pay, they also appear to want a further relief by not including the amount of beer they export. And again it’s a case of the larger breweries doing the majority of exporting, not the smaller ones. We know that pubs are closing at a still far too high rate. But closures are not even the worst part of it. We’ve seen that a lot of the medium to large breweries, the Squeezed Middle as they call themselves, are investing heavily in renovating and expanding their tied estates. These additional pubs in their estates may be saved from closure, but those free lines on the bar are now tied. We may be keeping some of the pubs, but the number of free lines is dropping, fast. Making it even worse are the tied deals that landlords of old and new pubs are signing up to. In exchange for a new cellar, and sometimes a cash loan or grant, landlords are limiting themselves to only being able to order in beers from selected wholesalers, or from a large brewery’s stable of “brands”. Choice of beer is already disappearing fast with both pub and brewery closures, with new pubs being tied to individual breweries or controlled wholesalers. With both the SBDRC and SIBA proposals that choice for the drinker will reduce even more as the larger breweries get richer, and the smaller breweries close, unable to compete. Big Beer is marching on, Medium Beer has picked up on their business tactics. Small, independent breweries are still struggling. In the 70’s CAMRA was formed to stop choice disappearing from the bars, and people say that they won the fight, that Real Ale is saved. They haven’t, it’s not. A battle might have been won, but the war rages on.